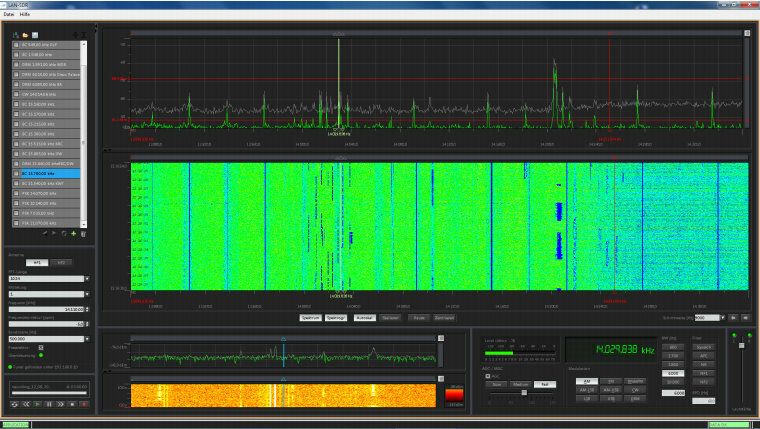 Test a professional SDR from the comfort of your home–free! Though I’ve not yet achieved particularly advanced age, my history in radio certainly started with the analog. The vintage Zenith Transoceanic my great-aunt gave me when I was eight was a wonder to tune, and its ability to extract signals from across the planet captivated me. But there was a certain amount of guesswork in the tuning process. So, when I purchased my first digital portable in 1990, it seemed revolutionary: in a snap, I could punch in a frequency, and there I was (virtually speaking). No guessing required. The next step in receiver evolution was, of course, Software-Defined Radios–those little boxes that you hook up to your computer that allow you incredible tuning flexibility and which permit amazing receiver performance. So, you’ve never tried an SDR–? I know a fix for that. In the course of an email conversation with Willi Paßmann, SDR support for SSB-Electronic, I learned that–simply by downloading a couple of files from their website–you can “test-drive” their high-end SSB LAN-SDR. Some SDRs–like the SSB LAN-SDR–actually allow you to record and to play back HF spectrum segments. In a basic example: if I want to record pirate radio stations one evening, but am not sure where they might pop up on the spectrum, I can set my SDR to record, say, an 80 kHz swatch of bandwidth from 6,915 to 6,995 kHz, from, for example, 9:00 pm to midnight. Later, I can play back and listen to the recording, with full demodulation and tuning capabilities. In other words, during playback, I can literally tune around in the spectrum, using all/any receiver functions of my SDR. It is as though I am listening and tuning, live, in real time, though it may be many hours or days later. Those of you with SDRs will not be surprised by this remarkable feature, as most likely, you’ve already experimented with this incredible time-bending functionality. Once you install their software and import the recording, you can literally tune through and use all of the receiver’s features within the spectrum recording. You can listen to the noise floor, test the notch, adjustable filters, DSP, tuning rates–literally experience all the receiver functions in this process. In my humble opinion, this is perhaps the most convenient and enjoyable way to try out a receiver. Hopefully, other SDR manufacturers will follow SSB-Electronic’s lead and make their control software and spectrum recodings available online for download and testing. This entry was posted in Manufacturers, Software Defined Radio and tagged SDR Spectrum Recordings, SDR Test Drive, Software Defined Radio, Software-Defined Radios, SSB LAN-SDR, SSB-Electronic on January 21, 2012 by Thomas.